I created this new compilation CD as a surprise gift for a group of young public school students in Seattle I was asked to sing for recently. Friendship and Goodwill was the title and to make it very special to them, I subtitled it; Songs for Mr. Rowe's 5th Grade Class and printed all their names on the back of the cover. I could never have imagined how much these kids would enjoy my songs. I've had ten and eleven year-olds stopping me all over this part of the city to tell me how much they enjoy the CD. The greatest surprise though, was that their music teacher so liked my song, By A Friend, that she plans to teach it to children throughout the school. I can't imagine a higher honor than children singing my songs. What is particularly satisfying to me is that these are the songs that I wrote for myself, natural expressions, not songs I intentionally fashioned for children. They are songs that people of all ages love and it pleases me to think that these very songs that came from my life and dreams are songs that might encourage children and young people to respect each other; to listen to each other's feelings and to honor every living thing on this planet. After writing about this on my website, several folks from around the country wrote to ask if they might buy a copy for their children. It surprised me and gave me the idea to make up a few copies to take to my concert last week in Southern California. My next surprise was even greater: people in the audience swarmed the CD table and bought all 16 copies I'd made. I could have sold fifty if I'd had them. The parents and the teachers in the audience, a school principal and a couple of officials from school administrations were overwhelmingly supportive of my idea of sharing songs of Friendship and Goodwill with children in schools. I've decided to explore the idea further. There is probably not a parent in the country not worried about violence and danger in our schools. I believe that one thing that can be done is to foster compassion and friendship and respect among our children. My hope is to sing for them more often and to begin to manufacture and distribute these CDs for no cost to schools around the country. I'll be seeking grants or sponsors to help me accomplish this. If you have ideas, please let me know. 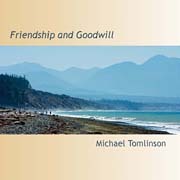 And if you'd like a copy for kids that you know - of any age - you may order copies of Friendship and Goodwill by clicking here.